China’s car market has been key to the recovery in global auto sales growth since 2009, as the chart shows. 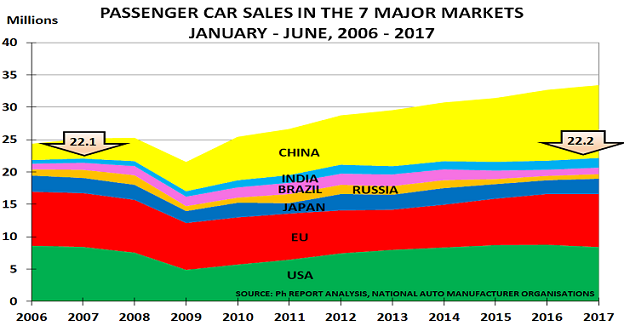 Its passenger car sales in the first half of each year have risen threefold between 2007 and 2017, from 3.1m to 11.3m today, while sales in the other top six markets have only just managed to recover to 2007 levels. But now major change is coming to China’s market from two directions. The first sign of change is the fact that H1 sales rose just 2.7% this year. This is the lowest increase since our records began in 2005 (when sales were just 1.8m), and compares with an 11% rise last year. Official forecasts for full-year growth have also been revised down, to between 1% and 4%, by the manufacturers’ association. A further sign of the slowdown is the rise in price discounting, with Ford China suggesting prices were down 4% on average in the first half. The second change may be even more important from a longer-term perspective. It seems likely that China’s used car market is poised for major growth. As the second chart shows, only 10m used cars were sold last year, versus 24m new cars. Yet used car sales are typically between 2 and 2.5 times new car sales in other large markets such as the US, where 2016 saw 39m used car sales versus 18m new car sales. One sign of the change under way was seen last month, when Guazi.com, China’s largest used car trading site, was able to raise a further $400m from investors to expand its service. Guazi, like BMW and others, have seen that the used car market offers very favourable prospects for growth prospect — as long as attention is paid to boosting buyer confidence by providing sensible warranties and service packages. Local governments have also played their part under pressure from central government. The state-owned China Daily reports that 135 local authorities have now removed barriers that prevented used cars from one province being sold in another. The effect of these changes is having an effect, with used car sales in January-May jumping 21% versus 2016. Such strong growth rates, and the slowdown in new car sales, suggest China’s auto market may have reached a tipping point. All good things come to an end eventually, and it seems prudent to assume that China will no longer be the main support for global auto sales. 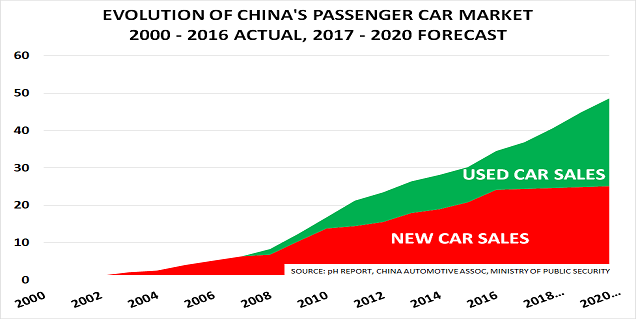 We expect China’s new car sales to plateau because of the combined impact of the end of stimulus (as discussed here in June), and the rise of used car sales, as these will inevitably cannibalise their volumes to some extent. Clearly this is not good news for those western manufacturers that have made China the focus of their growth plans in recent years. And there may be worse news in store, given the government’s determination to combat urban pollution by promoting sales of electric vehicles and car-sharing. Yet it will be good news for those prepared to develop new, more service-related business models. Used-car sales themselves can be highly profitable, while servicing and spare parts supply are likely to become equally attractive opportunities. Paul Hodges publishes The pH Report. On Monday, I discussed how OPEC abandoned Saudi Oil Minister Naimi’s market share strategy during H2 last year. None of this would have happened if Naimi’s policy had continued. Producers could not have raised the necessary capital with prices below $30/bbl. But now they have spent the capital, cash-flow has become their key metric. 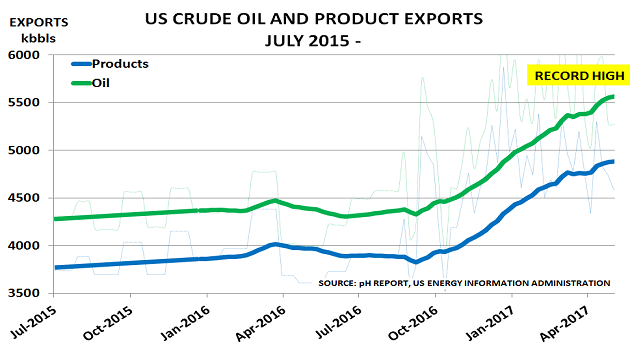 Before too long, the oil market will suddenly notice what is happening to US shale production, and prices will start to react. Will they stop at $30/bbl again? Maybe not, given today’s record levels of global inventory. As the International Energy Agency (IEA) noted last month, OECD stocks actually rose 24.1mb in Q1, despite the OPEC/non-OPEC deal. And, of course, as the IEA has also noted, the medium term outlook for oil demand has also been weakening as China and India focus on boosting the use of Electric Vehicles. “Matching lower revenues to the needs of growing populations who have become dependent on oil wealth will not be easy. It is hard to think of an oil-producing country that does not already have deep social and economic problems. Many are deeply in debt. “OPEC and some of the most important hedge funds active in commodities reached an understanding on oil market rebalancing during informal briefings held in the second half of 2016…. OPEC effectively underwrote the fund managers’ bullish positions by providing the oil market with detail about output levels and public messaging about high levels of compliance”. This gave the shale producers the window of opportunity they needed. Suddenly, they could hedge their production at a highly profitable $50/bbl – and so they could go to the banks and raise the capital investment that they needed. 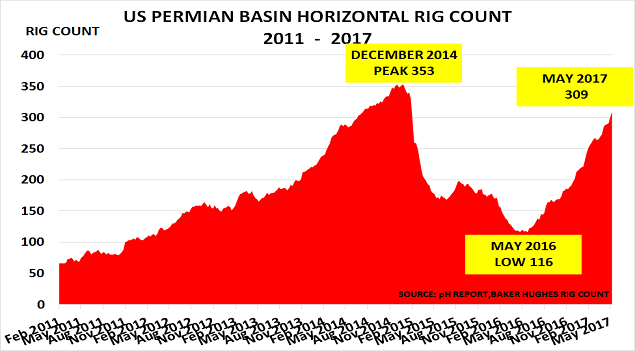 As a result, the number of rigs in the Permian Basin has nearly trebled. 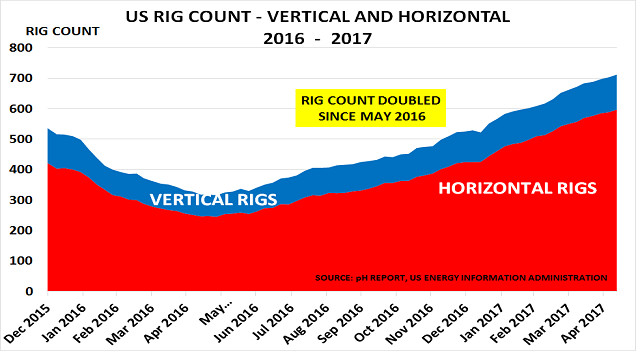 At 309 last week, the rig count is already very close to the previous peak. The Permian is an enormous field. 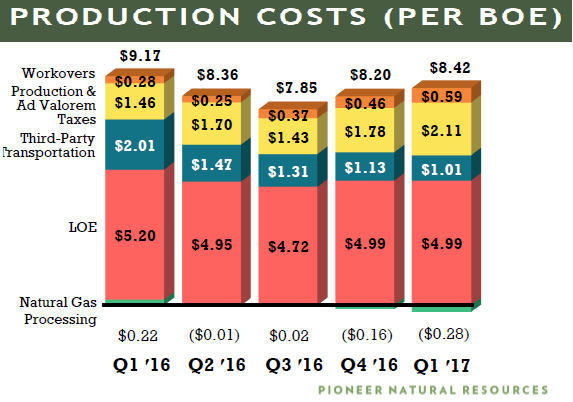 Pioneer’s CEO said recently he expects it to rival Ghawar in Saudi Arabia, with the ability to pump 5 million barrels/day. It is also very cheap to operate, once the capital has been invested. And it is now too late for OPEC to do anything to stop its development. On Thursday, I will look at what will likely happen next to oil prices as the US drilling surge continues. Ironically, the main winners from this are German car makers, as Greeks buy more German cars than any other brand. In terms of the top 5 major manufacturers, only Renault showed an increase over the month, up 5%. And this was despite increased discounts by majors such as Ford (14%) and Fiat (16%) in key markets such as Germany. Overall growth is also slowing, as the chart above confirms. Sales so far in 2015 are up 6.8%, but May was only up 1.3%. And the market continues to highlight the change underway in consumer preferences. Thus the biggest gainer has been sales of the Mercedes Smart car. Designed for cities, its sales were up 84% in May, and 56% so far this year after an updated 2-seater version, and a new 4-seater model went on the market. Their success highlights the opportunities now being created as we move slowly but steadily into the New Normal. Companies and investors who seize these opportunities will do very well – unfortunately, at the expense of those who cling to the supply-driven and product-based strategies of the past.